Youtube is full of lies! Lies I say! 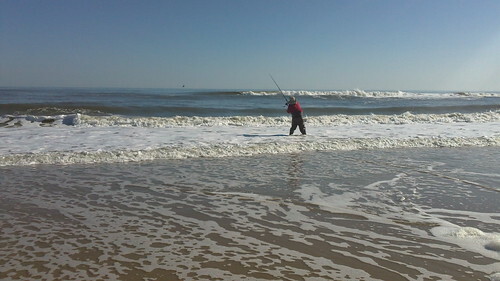 After watching hundreds of videos on Youtube of people surf fishing, I decided to give it a try. On Youtube everyone either caught tons of small fish, or a few really, really big fish. Plus, it looked very easy. In one video a 5 year old girl caught what looked like a hundred fish! 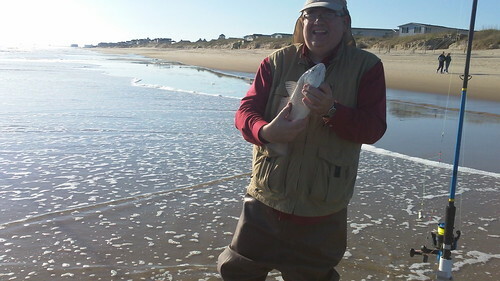 In another, this guy caught a dozen large shark in one night. Easy, fun, productive, why doesn't everyone do it? Because it is freakin' hard that's why! 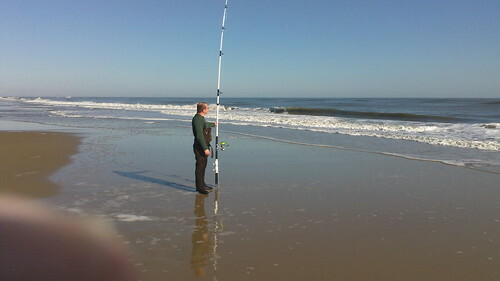 I already had chest waders and a 10' pole and matching reel, so I really didn't have to spend too much to get started. I did spent a little money and outfitted myself with a large frame spinning reel to match a 15' pole that was given to me. The only tackle I needed was weights, so I purchased a variety from 3 to 8oz. I made a couple sand spikes out of scrap from my workshop. The plan was for me to fish for two days, find the fish, and then my Dad would drive down and we would spend a day together fishing. Unfortunately, the weather did not cooperate. A nor'easter blew through creating very high tides and crazy surf. I tried fishing those first two days, but even my heaviest weights would just roll right back to shore. I'm talking 8oz hurricane weights. I wish I took pictures of the crazy surf, but I guess I was just too awestruck to even think of it. Needless to say, all I managed to do was tire myself out. Thankfully, the day Dad came down was much nicer. 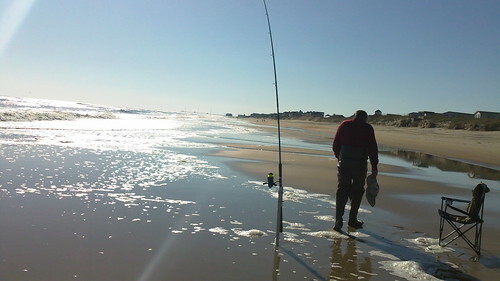 The surf died down and we could actually keep our baits out on the water. 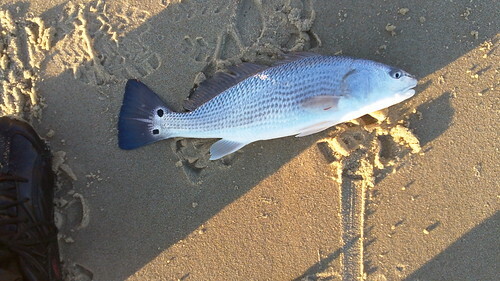 We both ended up with a 17" redfish and several smaller ones. 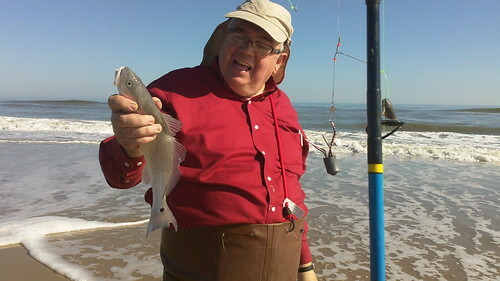 Cut finger mullet was the bait of choice, with mole crabs coming in at a close second. It wasn't the fishing extravaganza I had hoped for, but we did end up having a lot of fun. 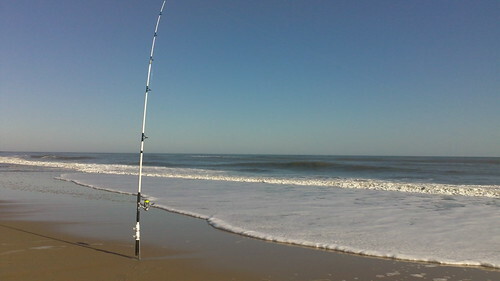 And by the way, one thing Youtube never mentions is how sore you will be after a day of surf fishing. My shoulders and arms ached after casting those huge rods and heavy baits. My legs and back were sore from fighting the surf. It was an amazing workout!